Speaking out for the first time about the harvesting of Facebook user data by a British firm linked to Donald Trump's 2016 campaign, Zuckerberg admitted Wednesday to betraying the trust of its 2 billion users and promised to "step up." 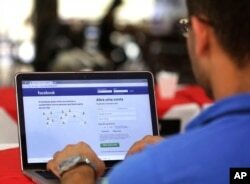 FILE - In this Jan. 4, 2018, photo, a man demonstrates how he enters his Facebook page as he works on his computer in Brasilia, Brazil. With pressure ratcheting up on the 33-year-old CEO over a scandal that has wiped $60 billion off Facebook's value, the initial response suggested his promise of self-regulation had failed to convince critics he was serious about change. "Frankly I don't think those changes go far enough," Matt Hancock, Britain's culture and digital minister, told the BBC. "It shouldn't be for a company to decide what is the appropriate balance between privacy and innovation and use of data," he said. "The big tech companies need to abide by the law, and we are strengthening the law." The app, downloaded by 270,000 people, scooped up their friends' data without consent — as was possible under Facebook's rules at the time. With Facebook already under fire for allowing fake news to proliferate during the U.S. election, Zuckerberg also said "we need to make sure that we up our game" ahead of midterm congressional elections in November, in which American officials have warned Russia can be expected to meddle as it did two years ago. And U.S. special counsel Robert Mueller, who is investigating Russian interference in the 2016 presidential race, is reportedly looking into the consultant's role in the Trump effort. Zuckerberg's apology followed a dayslong stream of damaging accusations against the world's biggest social network, which now faces probes on both sides of the Atlantic. Justice Minister Katarina Barley delivers a statement in Berlin, March 22, 2018. Barley says she is calling in Facebook's European leadership to explain the scandal involving data mining firm Cambridge Analytica and detail whether German users' data were affected. Meanwhile, European Union leaders were due to press digital giants "to guarantee transparent practices and full protection of citizens' privacy and personal data," according to a draft summit statement obtained by AFP. World Wide Web inventor Tim Berners-Lee described it as a "serious moment for the web's future." "I would say to him: You can fix it. It won't be easy but if companies work with governments, activists, academics and web users, we can make sure platforms serve humanity."